*Rates are expressed as "Celcius/Fahrenheit degrees", temperatures as "Degrees celcius/fahrenheit"
This schedule good for fine particled bodies (e.g. porcelains), these can be cooled quickly without loss of glaze surface quality. And it is good for glazes that matte too much on slow cool (e.g. G2934, it needs to be cooled quickly). -Step 1. Drying needs to be complete because the next step proceeds rapidly. Extend the soaking time if your ware is thick or heavy or the kiln is densely loaded. 240F, although above boiling point, is not enough to fracture ware, but needed to completely dry it. -Step 2 climbs quickly, your kiln may or may not be able to maintain the rate. If it can, consider increasing it to 400F/hr. The optional soak is to even out the heat distribution in the ware and enable the micro-bubble clouds of escaping gases of decomposition to combine and escape before the final push to top temperature (with a lower bubble population during that push). If you just need to heal blisters, the soak part of this step is not needed. -Step 3: The push to the final temperature. Include self-supporting cones 5, 6 and 7 frequently in firings to monitor the accuracy of your controller. Adjust the temperature of this step for each kiln you have. - Step 4: Use this step if you need to heal blisters. Free-fall 100F and hold. The reason: Bubbles often just percolate during soaks at top temperature, becoming blisters in the fired ware. Holding at the lower temperature imposes the melt viscosity sufficiently to overcome surface tension and burst the bubbles but still affords enough fluidity to heal them. You may need to customise this temperature for your kiln, ware and glazes. 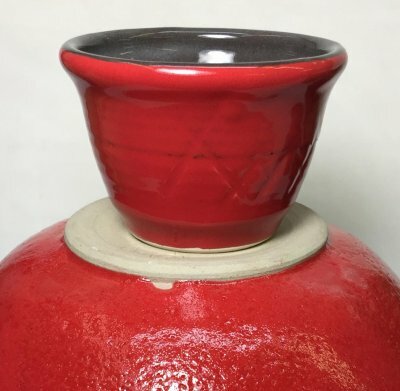 For example, if your glazes are more fluid and reactive, drop lower, perhaps 200F down (most boron glazes remain fluid down to even 1600F so experimentation may be needed). But do not go too low or the glaze could crystallize during the soak. I document programs in my account at insight-live.com, then print them out and enter them into the controller. This controller can hold six, it calls them Users. The one I last edited is the one that runs when I press "Start". When I press the "Enter Program" button it asks which User: I key in "2" (for my cone 6 lab tests). It asks how many segments: I press Enter to accept the 3 (remember, I am editing the program). After that it asks questions about each step (rows 2, 3, 4): the Ramp "rA" (degrees F/hr), the Temperature to go to (°F) to and the Hold time in minutes (HLdx). In this program I am heating at 300F/hr to 240F and holding 60 minutes, then 400/hr to 2095 and holding zero minutes, then at 108/hr to 2195 and holding 10 minutes. The last step is to set a temperature where an alarm should start sounding (I set 9999 so it will never sound). When complete it reads "Idle". Then I press the "Start" button to begin. If I want to change it I press the "Stop" button. Those ten other buttons? Don't use them, automatic firing is not accurate. One more thing: If it is not responding to "Enter Program" press the Stop button first. An example of how a carbonate can cause blistering. Carbonates produce gases during decomposition. 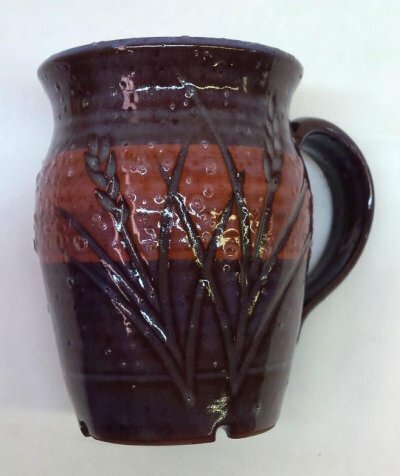 This glaze (G2415B) contains 10% lithium carbonate, which likely pushes the initial melting temperature down toward the most active decomposition temperatures. An extreme example of blistering in a piece fired at cone 03. The glaze is Ferro Frits 3195 and 3110 with 15% ball clay applied to a bisque piece. Is LOI the issue? No, this glaze has a low LOI. Low bisque? No, it was bisqued at cone 04. 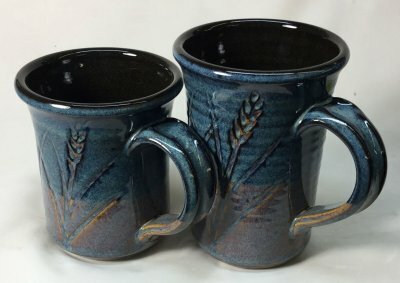 Thick glaze layer? Yes, partly. Holding the firing longer at temperature? No, I could hold this all night and the glaze would just percolate the whole time. Slow cooling? Close, but not quite. The secret I found to fix this was to apply the glaze in a thinner layer and drop-and-hold the temperature for 30 minutes at 100F below cone 03. Doing that increased the viscosity of the glaze melt to the point that it could break the blisters (held by surface tension) while still being fluid enough to smooth out the surface. 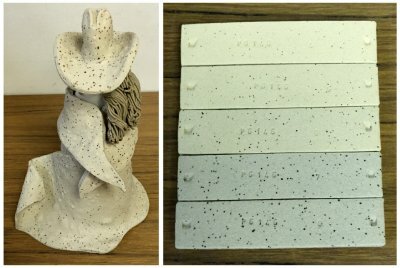 Why is the clay blistering on this figurine? This is an admirable first effort by a budding artist. 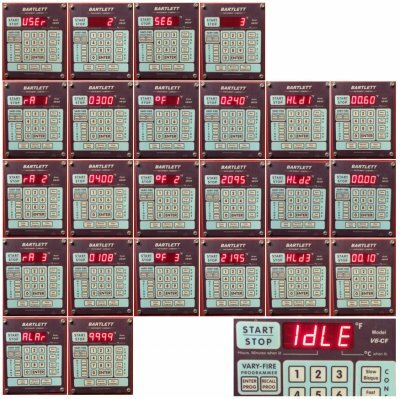 They used a built-in cone 6 program on an electronic controller equipped electric kiln. But it is over fired. How do we know that? To the right are fired test bars of this clay, they go from cone 4 (top) to cone 8 (bottom). 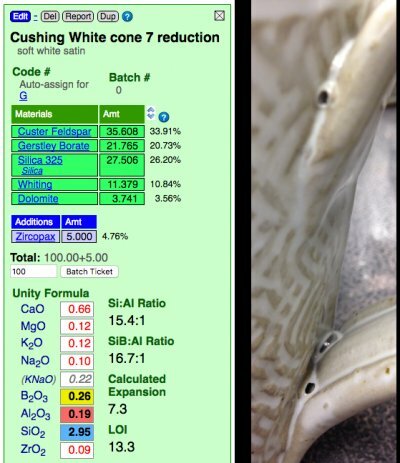 The data sheet of this clay says do not fire over cone 6. Why? Notice the cone 7 bar has turned to a solid grey and started blistering and the cone 8 one is blistering much more. That cone 8 bar is the same color as the figurine (although the colors do not match on the photo). The solution: Put a large cone 6 in the kiln and program the schedule manually so you can compensate the top temperature with what the cone tells you. Blistering in a cone 6 white variegated glaze. Why? 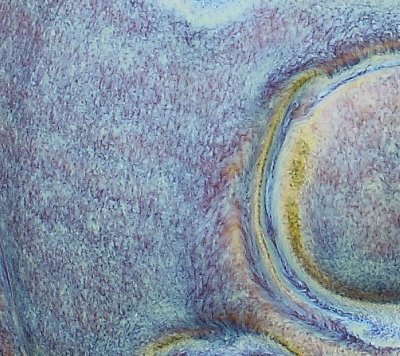 This glaze creates the opaque-with-clear effect shown (at cone 7R) because it has a highly fluid melt that thins it on contours. It is over fired. On purpose. That comes with consequences. Look at the recipe, it has no clay at all! Clay supplies Al2O3 to glaze melts, it stabilizes it against running off the ware (this glaze is sourcing some Al2O3 from the feldspar, but not enough). That is why 99% of studio glazes contain clay (both to suspend the slurry and stabilize the melt). Clay could likely be added to this to increase the Al2O3 enough so the blisters would be less likely (it would be at the cost of some aesthetics, but likely a compromise is possible). There is another solution: A drop-and-soak firing. See the link below to learn more. One more observation: Look how high the LOI is. Couple that with the high boron, which melts it early, and you have a fluid glaze melt resembling an Aero chocolate bar! Medium temperature transparents do not shed micro bubbles as well, clouds of these can dull the underlying colors. Cone 6 transparents must be applied thicker. 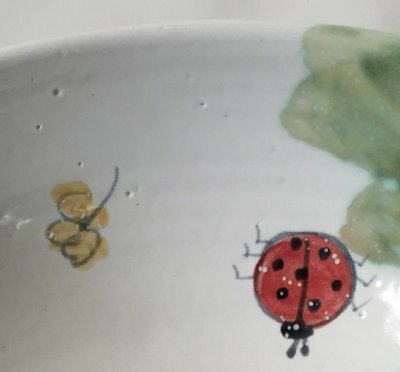 The stains used to make the underglazes may be incompatible with the chemistry of the clear glaze (less likely at low fire, reactions are less active and firings are much faster so there is less time for hostile chemistry to affect the color). 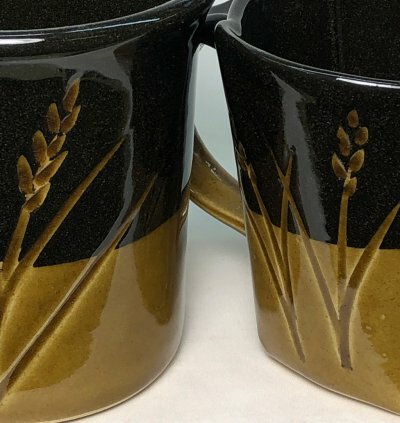 However underglazes can be made to work well at higher temperatures with more fluid melt transparents and soak-and-rise or drop-and-soak firing schedules. The boron and zinc fluxes make the melt of this glaze highly fluid at cone 7R. That comes with consequences. Notice the Al2O3 and SiO2 in the calculated chemistry. They are at cone 04 levels. The significant ZnO increases surface tension of the melt, this helps bubbles form at the surface (like soap in water). Al2O3 and SiO2 could be added (via more clay), this would stiffen the melt so the large bubbles would be less likely to form (this glaze melts so well that it could accept significantly more clay without loss in gloss). A drop-and-soak firing is another option, in this case a drop of more than 100C might be needed (see the link below to learn more). 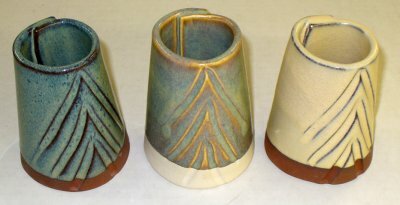 M340 stoneware fired to cone 6 (drop-and-hold schedule). The L3954B engobe fires deep black (it has 10% Mason 6600 black stain instead of the normal 10% Zircopax). It was applied inside and partway down the outside (a much less messy process than using a black clay body). They were bisque fired and glazed inside using the base GA6A Alberta Slip amber clear (using Frit 3195). 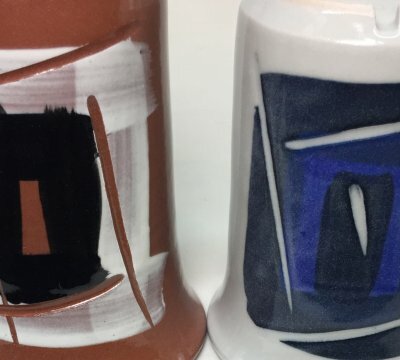 The outside glaze is Alberta Slip Rutile Blue (you are seeing it on the bare buff body near the bottoms and over the black clay surface on the uppers). 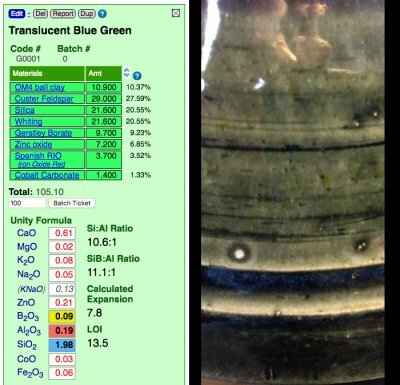 To learn more about how to make the engobe and start making black pots click "Product Data Sheets" at PlainsmanClays.com and go to the section on Medium Temperature. 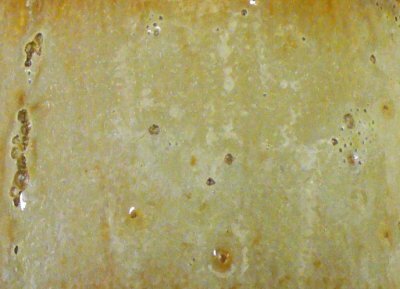 A bubbling glaze having an encapsulated stain fixed. How? These two pieces are fired at cone 6. 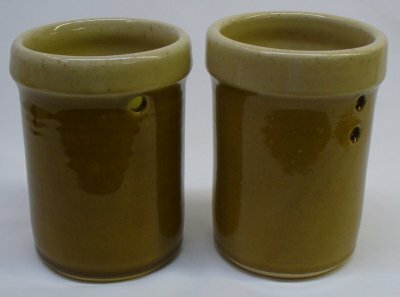 The base transparent glaze is the same (G2926B Plainsman transparent). The amount of encapsulated red stain is the same (11% Mason 6021 Dark Red). But two things are different. Number 1: 2% zircon has been added to the upper glaze. The stain manufacturers recommend this, saying that it makes for brighter color. However that is not what we see here. What we do see is the particles of unmelting zircon are acting as seed and collection points for the bubbles (the larger ones produced are escaping). Number 2: The firing schedule. The top one has been fired to approach cone 6 and 100F/hr, held for five minutes at 2200F (cone 6 as verified in our kiln by cones), dropped quickly to 2100F and held for 30 minutes. Deep, deep blue without any cobalt. How? These have to be seen to be believed, it is the deepest, richest blue we have ever produced. This is Plainsman M340 fired to cone 6. Black-firing L3954B engobe (having 10% Burnt (not raw) Umber instead of the normal 10% Zircopax) was applied inside and partway down the outsides (at the stiff leather hard stage). The incising was done after the engobe dried enough to be able to handle the piece. 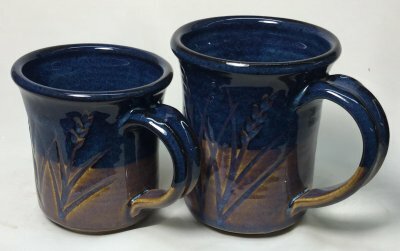 The glaze is Alberta Slip rutile blue. Firing schedule: Cone 6 drop-and-soak.